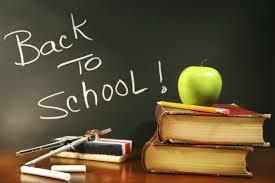 The little ones are headed off to school and you might be wondering what to do with all this time on your hands, especially if you want to work and haven't found a job yet at your new location. Binge watching Netflix with a glass of wine is always a viable option, but there are other slightly more productive uses for your time. Consider returning to school and continuing your education yourself, military spouse! Are you planning on maintaining a career in the future? As a military spouse, I know it can be difficult to maintain your career alongside your active duty spouse, as there are challenges such as a lack of tenure from moving frequently. I've personally made the decision to pursue a more long-term career a little further down the road. And remember, just because it is not doable now does not mean that it is impossible later. After having her first child, my sister-in-law decided that she wanted to continue her education in order to get her dental hygienist degree. Do you need to stimulate your mind? Is it time to exercise your brain a little? There are many ways to learn, and going back to school is a simple way to start stretching ourselves. My sister-in-law took 10 years off of school before returning and learned that she is far more adaptable to new learning methods than she ever dreamed. More than anything, the challenge of continuing her education was boost to her self-esteem. Are resources available for you? The answer is a resounding yes. There are multiple resources available to help military spouses in our educational endeavors. Military Spouse Career Advancement Accounts (MyCAA): "available to spouses of active duty service members in pay grades E1-E5, W1-W2, and O1-O2, including the spouses of activated Guard and Reserve members within those ranks. Spouses of Guard and Reserve members must be able to start and complete their courses while their sponsor is on Title 10 orders." Military Spouse Employment Partnership (MSEP): a targeted recruitment and employment solution for spouses and companies that: Partners Fortune 500 Plus companies with ALL Military Services, Provides human resource (HR) managers with recruitment solutions – military spouses, Prepares military spouses to become competitive, “job ready” applicants, and Connects military spouses with employers seeking the essential 21st century workforce skills and attributes they possess." With these questions in mind, drink that glass of wine, enjoy your downtime, and consider going back to school as you prepare for your future! Click below for even more career resources for military spouses and veterans!